Marty Switzer Merriam has helped singles, families, seniors and investors sell and purchase homes in Northern Virginia without all the usual hassles & pressures throughout her 25+ year real estate career. She understands that her clients deserve caring and competent service from an experienced, full-time savvy professional. Your needs and goals are her absolute priority and primary focus. Marty is constantly exploring and implementing new marketing strategies and technology to be sure her clients are steps ahead of the competition with the best possible results. Networking with agents across the US and participating in discussion forums helps Marty identify emerging trends to use for your benefit. Marty has a Masters degree in Business Administration (MBA), as well as executive level corporate experience. She has earned an Associate Broker's license, Certified Residential Specialist (CRS) designation and Senior Housing Specialist certification. She also qualified for the Accredited Staging Professional-REALTOR designation in 2007. Since becoming a licensed Realtor (in 1986), Marty has received outstanding sales awards. She is a Life-Time Member of both the Top Producer and Multi-Million $ Sales Clubs of the Northern Virginia Association of Realtors. She earned the coveted $10+ Million Dollar Club designation in 2006, 2004 and 2003. She was the team leaderfor the Arlington office Top Team awardin 2008, 2006 and 2004. 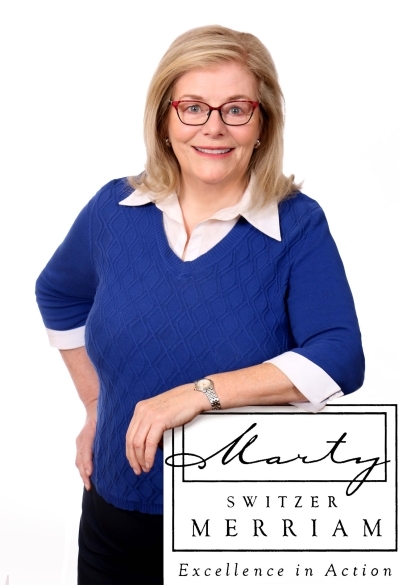 Marty is in the business for the long-term; valuing ongoing relationships with her clients after the transaction has closed, as their trusted advisor. Marty builds her business through referrals from her many satisfied clients, and welcomes your referrals. Text, email or call Marty today to begin your home selling or buying with a friendly, knowledgeable professional who will put YOU first! Rent includes a monthly cleaning service for this stylish, like-new condo with garage space. This home puts the ~luxe~ in luxury. It is thoughtfully renovated from top-to-bottom (2017-2018) with top-of-the-line everything. Gorgeous new acacia hardwoods throughout. Designer kitchen with silestone counters, gas cooking & tons of specialty cabinetry, including a newly-created pantry. The bathroom is incredible ~ Carrera marble floors and walls + fabulous double-wide shower. Beautiful master with wood blinds and remote-controlled ceiling fan. Enjoy wonderful western sunset views from this light-filled unit with 9-foot ceilings, walls of glass and coffee-sipping balcony. Custom living room blinds are remote-controlled, as is the 2nd ceiling fan. All systems and appliances are new and Energy-Star rated. Extra storage and fitness center, too! You are just steps away from Metro in the newly-emerging Ballston Quarter area with Shopping, Restaurants, Movies, Nightlife & Iceplex. Don~t miss this rare opportunity to rent a dream home in this upscale, concierge building (83 units), The Berkeley Condominium.